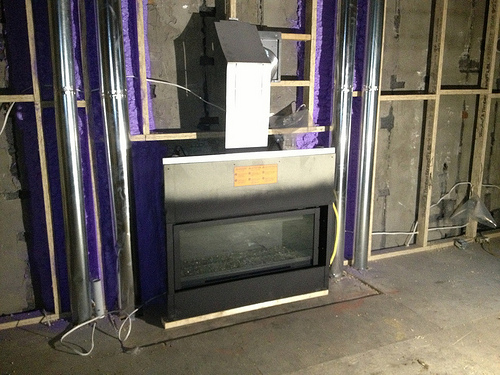 The fireplace has been installed. Our massive renovation project is chugging along. Plumbing and electrical have been mostly done. My central vacuum (YAY!) is going in, and this past holiday weekend Chris spent installing all the speaker and network wiring. Because we’re doing spray foam insulation, we have to anticipate as much future wiring needs as possible and get it in now, because it will be virtually impossible to fish anything through the walls after the foam is in. This means putting in all potential speakers, TV, alarm systems, even security camera wiring (even though we probably won’t install a lot of that ourselves). We’re also running the low voltage stuff for any outdoor needs. 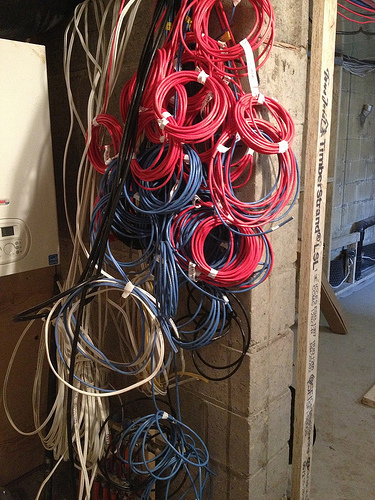 Beginnings of the network room. The waterproofing guys were even there for part of the weekend doing the parging, drain laying and grading. 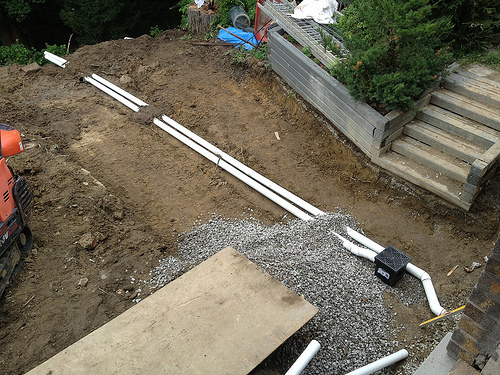 We now have some nice strip drainage and a proper catch basin at the basement walk-out entrance in the backyard. Before there were only tiny shower drains installed that easily blocked with leaves and debris. 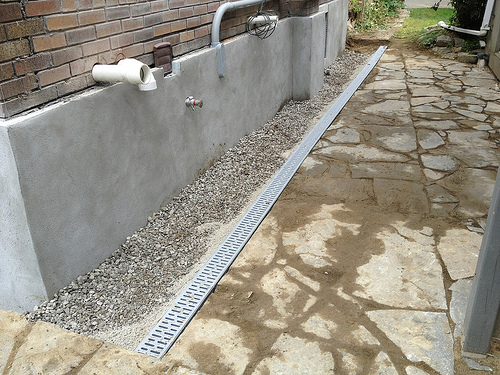 Parging over the waterproofing, strip drain added along side of house. Even Luna and I got recruited to do some foil taping around the ductwork. Well, me more than Luna for the taping. 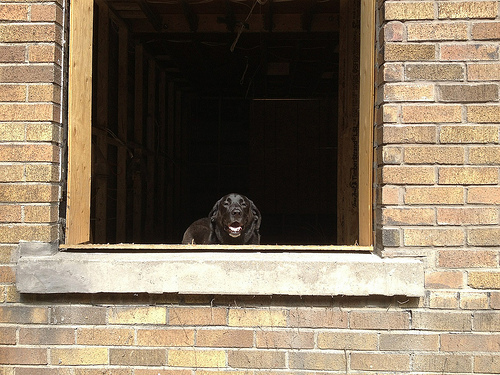 She kept an eye on the comings and goings of the neighbourhood through the window holes. As for the taping, the HVAC guys did a pretty good job but we noticed a few screw holes here and there and opted to take the time to seal up the ducts and the cold air returns as much as we could. It was nice to do a little work on the place ourselves. Unfortunately there’s been a fairly significant delay with the delivery of our windows and doors, which is now setting things back by a couple extra weeks. There have been some quality assurance problems with the glass — something we’re happy to hear is being addressed now rather than discovering problems later, but it does mean we’re now looking at late November as the finalization. Boo. Ah well. It is what it is, right? The spray foaming can’t really happen until after the windows are in. So in the meantime, the roof, siding, soffits, facia and eaves will get dealt with. They’re waiting on some plan changes for the porch but once those come in they’ll get started on that too. We’ve finalized our cabinetry for the living room and mud area at the basement walk out. More to come!